Sundial Moto Sports • View topic - New member from South Dakota. Post subject: New member from South Dakota. Hello from sunny western South Dakota, and as far as I know, very likely the only GT750 owner within hundreds (and hundreds) of miles. 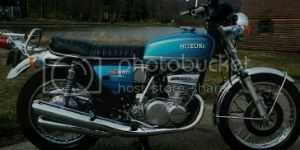 Fast forward to the early 2000's, and I was riding this blue GT750L, a very nice original example that I owned for about ten years, finally selling it in 2003 on ebay to a Japanese collector, who was going to have it shipped back to Japan, where I assume it is now....by the way, in 2003 it sold for only $2100. I've been kicking myself (weekly) ever since. There were a few others in between, another blue 1974, and a non-running 1976, which brings us to the present. Last year my brother in St. Paul put his blue 1974 Buffalo on ebay, where I spotted it (I didn't know he was going to sell it). I bought it for too much money, paying $3000 for it on the spot. He had owned this bike for at least twenty years and I kind of wanted to keep it 'in the family' and had very much wanted another GT750 anyway. The bike looked better in the ebay photos than it really was IMO, it hadn't been ridden much in the past few years and Minnesota's humidity had taken it's toll on the bike as it sat in the often damp garage. When I picked the bike up, it was leaking gas from the petcock, a bit of oil from somewhere underneath, and although it would start, it would only run on the two outboard cylinders. Cosmetically, the bike was fair, looked good from twenty feet away, but a look up close revealed a lot of aluminum tarnish, grunge, and quite a bit of surface rust. I also curently have a 2007 ZX14 Kawasaki, a 2002 Triumph Bonneville T100, a 2003 GL1800, and my wife owns a 2003 Harley V-Rod, so it's not like we don't have anythng else to ride while the Buffalo is being worked on. I've owned about fifty motorcycles since 1966, and my wife has owned around eleven. Post subject: Re: New member from South Dakota. Cool pics. You know a picture is old, when you see a storage facility with wooden garage doors. They look like wood in the photo, but they were actually brown metal. I effectively destroyed that nice 750M, not the usual way by crashing it or blowing it up, but I took it apart and never re-assembled it. 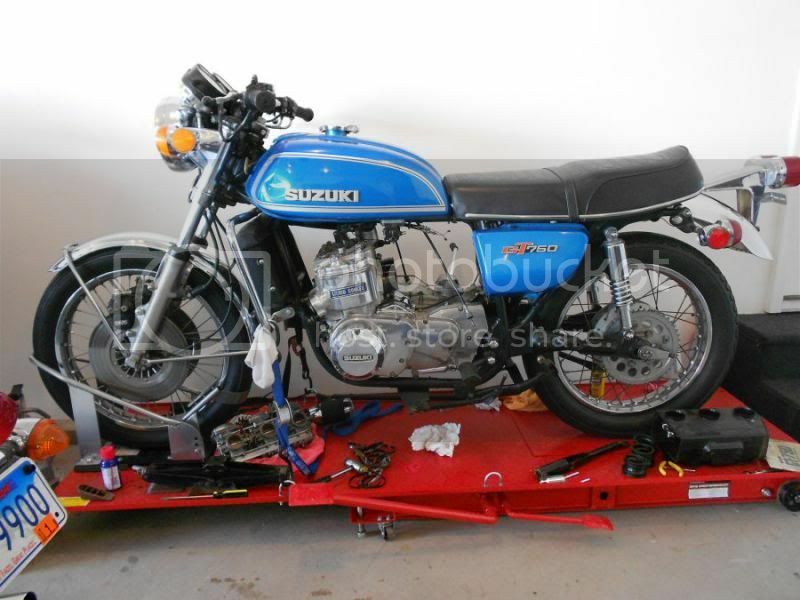 One of the exhaust header bolts had stripped, and I foolishly removed the engine to get it repaired (not knowing if It was really neccesary), I later sold the bike in parts to my brother (the same one I bought the blue '74 from last year), who also never put the bike back together. I think he still has most of it in his garage in St. Paul. What a shame, and waste of a nice old bike.